Work us through Sporting’s transfer activity so far this summer. Any big name arrivals/departures? Despite leading the team to victory in the Portuguese Cup, Marco Silva was relieved of his duties as head coach at the end of last season, and was replaced by long-serving Benfica coach Jorge Jesus. What can we expect from Sporting’s new coach? Lots of headlines for the Portuguese press! Kidding aside, we should expect to see a lot of similarities between this year’s Sporting and Jesus’s Benfica teams of previous years. We’re likely to see lots of pressing, attacking football. Fullbacks Jefferson and João Pereira will be called upon to support the attack on the flanks, while traditional wingers Ruiz and Carrillo will be allowed the freedom to move to interior spaces. Up front, Teó/Montero will be the Lima to Slimani’s Jonas, frequently playing a supporting striker role. I think the emphasis on attacking football will reveal a more “urgent” Sporting. Marco Silva’s team of last season had a frustrating tendency to meander through matches, often resulting in Sporting needing to chase the score near the end of matches. I expect that Jesus will be able to get the team off the blocks faster in matches this season. Just as a recap, how did Sporting finish last season? What are the expectations this season? Sporting fell out of the title race in the second half of the season and finished in third place in the Liga. However, they did win the Portuguese Cup after a thrilling come-from-behind victory over Braga, leading to the club’s first major trophy under the Carvalho administration. With the signing of Jesus, acquisition of new players and retention of bedrock players, Sporting clearly expects to and should challenge for this year’s title. Last season, Sporting’s lack of squad depth became evident as they faded toward the end of their European and domestic campaigns, Cup victory notwithstanding. This season’s squad already appears more robust, with more solutions to the inevitable injuries and suspensions that happen during the grueling European calendar. Who will Sporting’s danger men/most important players be this season? Slimani remains Sporting’s most consistent scoring threat, but I expect both Teó and Montero to have fruitful campaigns under Jesus’s system as well. However, William remains the team’s most important player. He alleviates pressure off the center backs and is a catalyst for the offense. As he goes, so goes Sporting. Jesus said after taking the job that he would get even more out of William. If he is able to do that, Europe’s football giants will come calling again. Additionally, João Mario has started off the season in superb form and seems ready for a breakout season. Run us through Jesus’s preferred formation at Sporting. What can we expect? Can you predict a starting eleven? The 4-4-2 or even 4-2-4 that we’ve seen Jesus rely on will likely continue. When everyone is healthy, the lineup will likely be: Patrício, Pereira, Paulo Oliveira, Ewerton, Jefferson, William, Adrien/João Mario, Carrillo, Ruiz, Teó and Slimani. Carlos Mané, Aquilani and Montero also should be key contributors this season. The transfer window will be open until September 1st. Will Sporting dip into the transfer market further? The way this transfer season is going, I don’t know what to expect! I don’t think there are any glaring holes that need to be plugged, so I don’t expect Sporting to be heavily involved. I think the challenge now is to hold on to players that have a big market – specifically William and Slimani. As teams get desperate around the deadline, someone may make an offer for a key player that Sporting can’t refuse. Similarly, if the club is unable to re-sign Carrillo, whose contract is up in 2016, they may consider a reinforcement for the right wing. Are there any young talents who have a chance at playing time this season? For all the criticism that Jesus has faced with regard to his handling of youth players (see Bernardo Silva), he has already opened the squad up to some of Sporting’s famed Academia’s brightest talents. Gelson Martins had a stellar U20 World Cup and featured in much of this pre-season. Although he is starting the season with the B team, I think the current jewel of Sporting’s youth system, Matheus Pereira, will be called up to the first team at some point. This Sporting squad is built for success. But each of the other members of the Big 3 have also made improvements so it should be a tight race the whole way. 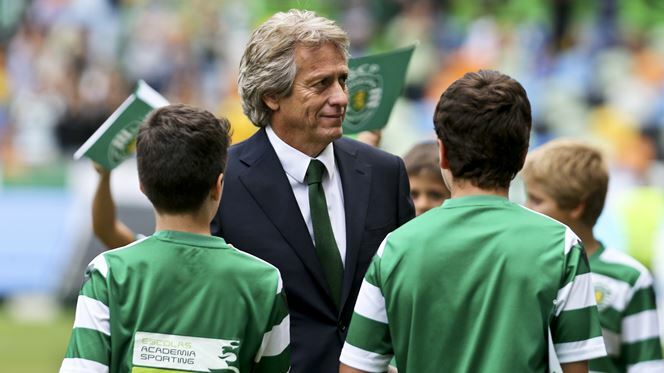 Jorge Jesus is the most experienced and most successful manager in Portugal right now. He knows what it takes and last year with Benfica he proved that he can get the most out of a group of players. Despite all of the transfer activity this summer, the leaders of Sporting’s team, Rui Patrício and Adrien, remain to guide the ship. It’s been 13 long seasons since Sporting’s last title, but I really like their chances to bring the Liga crown back to Alvalade this season.